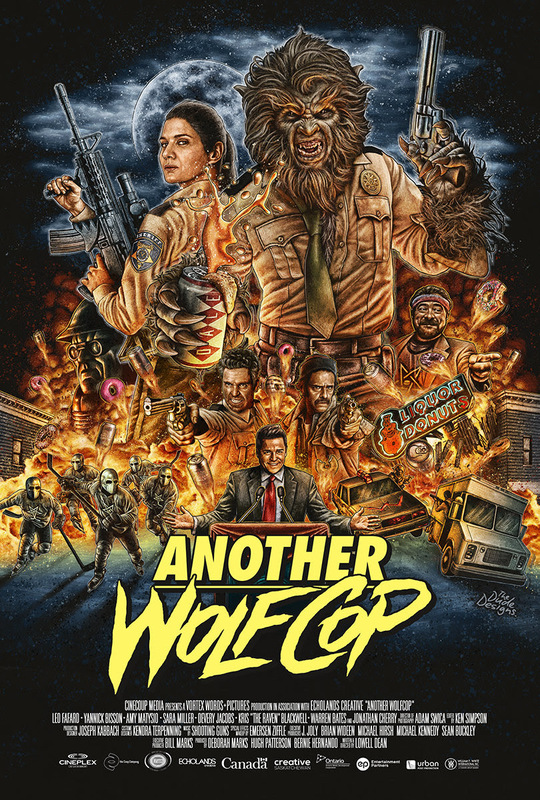 Directed by Lowell Dean (WOLFCOP), the film stars Leo Fafard (WOLFCOP), Amy Matysio (STRANDED), Jonathan Cherry (GOON: LAST OF THE ENFORCERS), and Yannick Bisson (Murdoch Mysteries). Alcoholic werewolf cop Lou Garou (Leo Fafard) springs into action when an eccentric businessman with evil intentions seduces Woodhaven’s residents with a new brewery and hockey team in this outrageous horror-comedy sequel. Look at the left-hand side of the poster above the liquor and donuts sign, is that Kevin Smith?